If you were a child of the 80s, chances are you owned, listened to or watched the tiny blue creatures known asthe Smurfs. Created by Belgian comic artist, Pierre Culliford (better known as Peyo) in 1958, the Smurfs became a permanent part of the 80s pop culture when the Hanna-Barbera cartoon launched on Saturday morning cartoons in 1981. Fast forward to today and the Smurfs continue to entertain millions of people around the world. 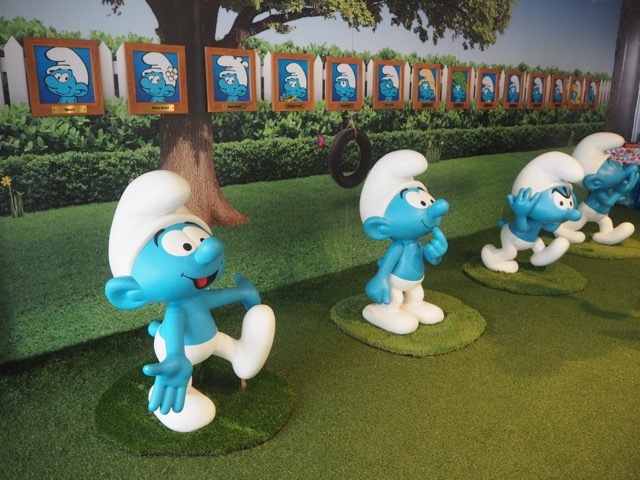 From now until December 24, Harbour Town Melbourne will host the ‘We’re All Smurfs!’ Exhibition, a stunning Smurf village where you will find 35 Smurfs on show for the first time in Australia. Plus each weekend, children can attend the Smurf Craft Village and participate in free craft activities, including Spring planting, puzzle colouring, gnome painting and much more! We arrived at Harbour Town Melbourne ready for a celebration of everything small, blue and Smurf-like! As we made our way to the Smurf Craft Village for the ‘We’re All Smurf's! Exhibition VIP launch party, the poppets could not resist stopping to admire the Smurf village on our way past. Arlo stood mesmerised by the 1m high Smurfs while Macy had already spotted Poet Smurf at the entrance - with parchment and quill in hand - and was giving him a kiss on his nose and a big cuddle. Smurfing cute! Once in the Smurf Craft Village, the little ones were invited to find a chair at the adorably styled tables and colour in their own Smurf pencil case. Well, Master Arlo took one look at the table, bypassed the pencil case entirely and instead began to devour the vanilla iced cupcake with edible Smurf topper! Needless to say that it didn't take Miss Macy long to see what her brother was up to and she quickly joined him at the table licking icing off her cupcake and flashing me a big smile. When the last crumb of cupcake was finished, we started to explore the rest of the Smurf Craft Village. We had only taken a few steps when a life-size Papa Smurf appeared for a meet and greet session. With his bushy white beard and bright red clothes, the little ones loved getting up close to Papa Smurf who posed for photos, gave out high-fives and accepted many cuddles from his admiring fans. Grandpa and I enjoyed taking a trip down memory lane, looking at the Smurf History Wall while the poppets visited the talented face paint artist and had a butterfly (Macy) and toadstool (Arlo) painted on their cheek and hand respectively. We scooped a few treats from the beautiful blue, white and red themed lolly buffet into our blue and white polka dot favour boxes before waving goodbye to Papa Smurf and making our way back over to the exhibition. By this time the exhibition had opened and was already buzzing with people. Arlo and Macy had the smurfiest time exploring the village and discovering the different blue creatures and their mushroom houses. They loved admiring beautiful Smurfette with her long golden locks, smelling Dreamy Smurfs flowers, watching Painter Smurf in his berry-red jacket and dark blue tie with artist pallet and paint brush in hand, climbing up the ladder to help Handy Smurf paint a mushroom house, collecting apples with Farmer Smurf, sharing a sandwich with Hungry Smurf and lounging back on Deck chairs with Lazy Smurf. There are plenty of photo opportunities as you make your way through the exhibition and don't forget to visit the 4 metre high giant Smurf that is floating above the nearby walkway. 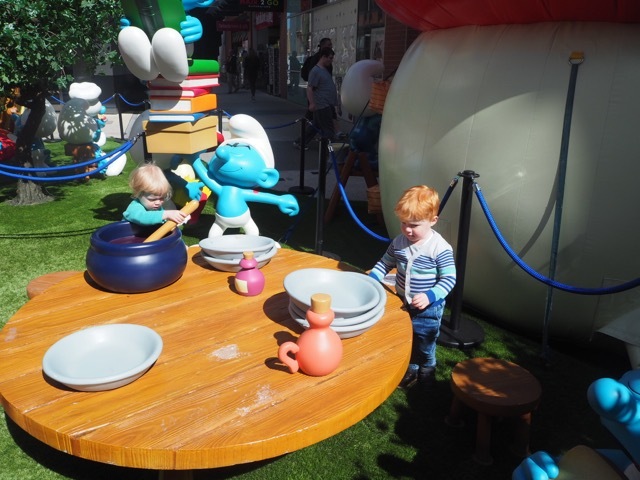 A visit to the ‘We’re All Smurfs!’ Exhibition at Harbour Town Melbourne will certainly bring your childhood back to life and like us, allow you the opportunity to introduce your little ones to these adorable blue little people. Plus I guarantee that at some point of your visit you will be singing or humming “La la la-la la la, Sing a happy song. La la la-la la la, Smurf it all day long”. Trust me. Entry to the exhibition and participation in craft activities is FREE, woo hoo! The exhibition area isn’t big and doesn’t take long to fill up, so go early before it gets busy. The exhibition is not undercover so come prepared for all weather conditions. Children (and adults) are not allowed to climb on the Smurfs in the exhibition but cuddles, kisses, hand shakes and fist pumps are encouraged! Pram parking is available next to the exhibition and inside the gates of the craft village. For more information about the 'We're all Smurfs' exhibition and the craft activities at Harbour Town Melbourne, checkout their website. For more ideas of what to do in Melbourne, checkout our blog or Daily Spots List.